You are at:Home»English»Community News»Business»Otsukare-sama, Arigato! Sanuki no Sato owners count down to retirement at year’s end. GARDENA — Junko and Hitoshi Komiyama, both 65 years old, are smiling in front of their 25-year-old restaurant, Sanuki no Sato in Gardena (182nd Street and Western), in anticipation of their official retirement on Dec. 31. 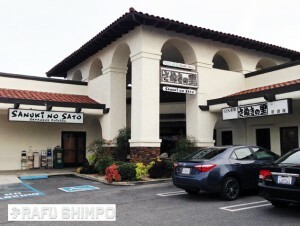 According to Hitoshi, they sold the restaurant to Japan-based U.S. company, Kanefuku (Kamerycah Inc.) in Torrance at the beginning of this year. Ownership officially transferred on Jan. 31, 2014, and the Komiyamas have been coming to the restaurant over the past 11 months for transitional support. “Even with the new ownership, the staff members are the same, so you may not have even noticed the difference, and that was the condition of the agreement,” Hitoshi says. They have a total of 13 chefs — three Japanese speakers and 10 Spanish speakers — and more than dozen waiters and waitresses to run the restaurant, which can hold 150 guests at one time and serves more than 200 Japanese food items. The couple originally came from Yamanashi Prefecture and have known each other since high school. Hitoshi went to a university in Kyoto and came to the U.S. along with his karate friend in 1972 after his graduation. He taught judo at and later worked at several jobs, including a travel company. Hitoshi started becoming involved in the restaurant business when his senpai (mentor) from judo invited him to become a manager of the restaurant Mifune in Aji no Meiten Gai, a food court in Little Tokyo’s Japanese Village Plaza, in 1984. Hitoshi mastered the method of making noodles there and decided to open his own restaurant. When he thought about the theme of the restaurant, he thought that the best place for noodles in Japan is the Sanuki region of Kagawa Prefecture, Shikoku. 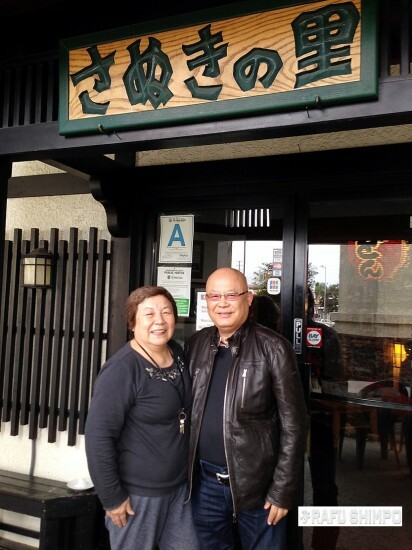 After traveling through the area with his wife and learning the authentic taste, he chose the name Sanuki no Sato, meaning “hometown of Sanuki,” so that people would know it is more than just a noodle house. “Since our opening in 1989, I can see the change in that the number of Japanese expatriates are decreasing and we know that Toyota in Torrance will be moving to Texas next year,” he said. “However, we have more Nikkei people and Asian Americans as our customers. Luckily enough, we have been successful. The restaurant is also known for the Japanese celebrity photos and autographs that fill the wall at the entrance area—you can see hundreds of photos of Hitoshi taken with an Olympic medalist, singers and actors. Hitoshi is a big fan of Bruce Willis. Around his 50th birthday, Hitoshi shaved his hair just as the actor did. On Dec. 31, they will serve toshikoshi soba (year-end noodles). Currently, the restaurant is accepting pre-orders for kaiseki osechi ($350) specially prepared for New Year’s while supplies last. The restaurant will reopen in 2015 on Jan. 2. Established in Fukuoka Prefecture in 1971, Kanefuku is known for a manufacturer of mentaiko (seasoned Alaska Pollock roe). Kanefuku started its restaurant division in 2000 and currently runs two restaurants, Kissui Hakata Ramen Fukucha and nabe (hot pot) izakaya Tsukiji Fukutake, both in Tsukiji, Tokyo. The important question is, will the Spiderman doll in the rafters of the dining room still be there after the transition? !